It is a device able to support the driver, with electronic control, which allows driving at speed over 30 km/h on long and straight dry roads (e.g. : motorways), at a desired speed, without pressing the accelerator pedal. Therefore it is not suggested to use this device on extra-urban roads with traffic. Do not use it in town. Turn knurled ring (A) to ON. The device may only be engaged in the 4th or 5th or 6th gear. Travelling downhill with the device engaged, the car speed may increase more than the memorised one. cluster turns on together with the message on the reconfigurable multifunction display (where provided) (see section “Warning lights and messages”). turn the knurled ring (B) to (+) for at least three seconds, then release it. The car speed is memorised and it is therefore possible to release the accelerator pedal. press the RES button (C). momentaneously turning the ring (B) to (+). Each pulse of the ring will correspond to a slight increase in speed (about 1 km/h), while pressing continuously will correspond to a continuous speed increase. keeping the ring (B) pressed at (–) until reaching the new speed which will be memorised automatically. Each pulse of the ring will correspond to a slight reduction in speed (about 1 km/h), while pressing continuously will correspond to a continuous speed reduction. 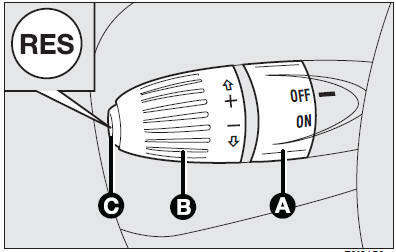 Turn the ring (A) to OFF or the ignition key to STOP. unvoluntarily moving the Dualogic lever (where provided) to (N). the device on, do not put the gearbox lever in neutral and do not shift the Dualogic gearbox lever (where provided) to (N). malfunction or failure, turn the knurled ring (A) to OFF and contact a Fiat Dealership after checking the protective fuse integrity.